Calcium is the most abundant mineral in the body. But, rarely in western civilizations does dietary calcium intake reach sufficient levels. Sonne's #2 Calphonite™is a unique, time-tested calcium supplement that contains essential metabolic cofactors: phosphorous, magnesium, and manganese. Our patented process breaks down dicalcium phosphate into its ionic state, making the calcium more soluble and bioavailable. The calcium in Sonne's #2 Calphonite™ is absorbed 8 times more readily than the calcium in bone meal or regular dicalcium phosphate, permitting assimilation into the bloodstream within an hour and a half. Many Americans over the age of 30 are deficient in hydrochloric acid, and cannot properly digest and assimilate protein and calcium-rich foods. 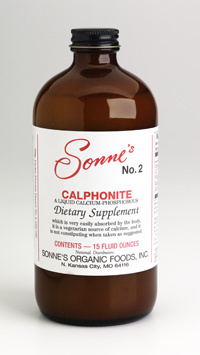 Sonne's #2 Calphonite™ is different. It provides liquid calcium in a naturally acidic state, providing an immediately bioavailable calcium supplement. Since the body needs calcium more than any other element except water, our #2 Calphonite™ is a wonderful solution for anyone who is not getting sufficient calcium in their daily diet. Sonne's #2 Calphonite™, our liquid calcium supplement, contains demineralized water, montmorillonite, dicalcium phosphate, magnesium, and manganese. Through a special process, the dicalcium phosphate is broken down, and the calcium is bound in the ionic state to phosphated montmorillonite. Compared to regular dicalcium phosphate, the calcium in Calphonite™ has a much greater assimilation rate. The result is a calcium supplement that is very easily and quickly assimilated by the body (within 90 minutes). Our special patented process substantially reduces the size of the original calcium crystal to its ionic state. This greatly increases the amount of calcium that is immediately assimilated by the body. With this process, we supply as much immediately available calcium in 16% of the Daily Value (%DV) as would be available if we were to use a full 100% DV of the same calcium similarly processed. Our Calphonite™ has an acidic pH of approximately 4.6. This is significant because most other calcium supplements on the market have an alkaline pH, which can neutralize the hydrochloric acid in the stomach. Gastric acids are important to break down (non-ionic) calcium crystals. If the digestive juices are already weak in an individual´s stomach, an alkaline calcium supplement will further dilute them. A lack of acidic medium prevents the calcium from being broken down to a form and size the body and bloodstream can utilize. Since all of the digestive juices from the small intestines onward are alkaline, if the calcium is not broken down in the stomach, it will remain in an unassimilated form. Another advantage to the acidic pH of our Calphonite™ is that it can be taken with meals without diluting the natural digestive juices. It should also be noted that the fat-soluble vitamins A & D are essential for proper calcium metabolism and assimilation. Many customers have found the immediate effects of Calphonite™greatly increased when it is taken with our #5 Cod Liver Oil. Therefore, we recommend taking both simultaneously. 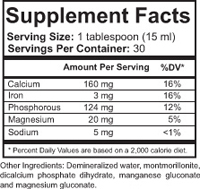 It can be taken with juice in a ratio of 2 parts Calphonite™ : 1 part #5 Cod Liver Oil. Directions: 1 tablespoon directly after each meal (three times daily). May be taken as it comes from the bottle, in water or milk, or as desired for dietary supplementation. To enhance calcium absorption, take with #5 Cod Liver Oil. Literature: "Calphonite™" (Newsletter No. 4 ), "A Brief Analytical Description of Calphonite™," and "Report of Assay"